A nominal fee of £10 per session is charged to voluntary and charitable groups to help cover the cost of heating, lighting & maintenance. 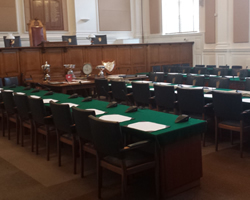 The Committee Room seats up to 20 people and has disabled access via a lift in the Council Chamber. The room benefits from oak panelled walls and a large leaded bay window overlooking St Paul’s Church. Blinds are fitted to the window which allows the room to be used for viewing presentations. The Council Chamber seats up to 60 people. It was formerly a court room and still retains many of the original features. A Conference PA System and Translation equipment are available in this room, however, you must provide your own translator. The room has large windows and although these are fitted with blinds it is not the perfect environment for viewing slides during the day time. 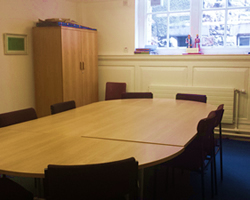 The Small Meeting Room is located at the back of the Town Hall and is ideal for up to 10 people. The room is typically used for small business meetings and classes. It is easily accessible and is close to the disabled entrance.